Papers published in this journal are checked by other scientists before they are published. 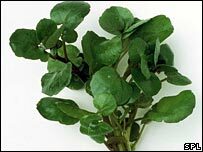 During the study 60 healthy volunteers, including 30 smokers, ate an 85g bag of fresh watercress every day for eight weeks. The researchers carried out tests before and after this change in diet. They found that DNA damage to white blood cells was cut by 22.9%. The cells were also more able to protect themselves from the damaging effects of particles called free radicals. When cell samples were exposed to hydrogen peroxide, which generates large numbers of free radicals, damage levels were 9.4% lower than would normally be expected. Blood levels of antioxidant compounds, such as lutein and beta-carotene, which can combat the effect of free radicals were raised. In contrast, levels of potentially harmful triglycerides were cut by an average of 10%. The beneficial changes were greatest among the smokers - who were found to have significantly lower levels of antixoidant compounds at the start of the study. Previous studies have suggested eating increased amounts of cruciferous vegetables like watercress is linked to a reduced risk of a number of cancers. One study on human colon cancer cells showed watercress extract cut DNA damage in the cells, and helped control their growth and spread. But lead researcher Professor Ian Rowland, who is now at the University of Reading, said the latest study was important because it involved people eating watercress in easily achievable amounts, rather than lab tests on vegetable extracts. He said: "Blood cell DNA damage is an indicator of whole body cancer risk, and the results support the theory that consumption of watercress is linked to an overall reduced risk of cancer at various sites in the body." Lynn Faulds Wood, the former BBC Watchdog presenter who set up Lynn's Bowel Cancer Campaign after successfully fighting bowel cancer, said: "It's great to know there are simple things that people can do - like eating watercress - which could help them avoid getting cancers like bowel cancer in the future." Claire MacEvilly, a nutritionist at MRC Human Nutrition Research, said: "What is interesting to us is that the scientists have been able to quantify the actual amount of watercress needed to reduce the risk of developing cancer and that the recommended amount is achievable in a typical day. "Questions still remain about how the compounds in vegetables work in the body to reduce the risk of cancer but the results of this study add to the body of evidence that eating fruit and vegetables is important in the prevention of this series disease." Dr Anthea Martin, of the charity Cancer Research UK, said larger studies were needed to determine whether the effects of watercress on cells seen by the researchers translate into a decreased risk of developing cancer. Professor Karol Sikora, cancer expert at Imperial College London, pointed out that all fruits and vegetables affect DNA damage, hence the recommendation that people eat five portions a day.